It goes without saying, the importance of Gal Oya Valley Irrigation Project that straddles the border of the Monaregala district of Uva Province and Ampara district of the Eastern Province of Sri Lanka was summed up in those words of the Rt. Hon. D. S. Senanayake, the first Prime Minister (1948-1952) of Free Ceylon on 28th August, 1949 on the inauguration of the project. Those words were then aptly inscribed on a commemoration pillar erected at Inginyagala in three languages: English, Sinhala and Tamil. It was only a little more than a year ago, to be precise, on 4th February 1948, Ceylon was granted independence from the Britain. That was following a peaceful struggle led by Sir James Peiris, D.B. Jayathilake, E. W. Perera, Dr. Colvin R. de Silva, A. E. Goonesinghe, S.A. Wickremasinghe, Arthur V. Dias, D. R. Wijewardene, Sir Ponnambalam Ramanathan, Sir Ponnambalam Arunachalam, Sir Razeek Fareed, Miss. Vivienne Gunawardena and E. W. Jayawardane. Being freed from the shackles of colonialism, the wealth of the land remaining where it ought to, the need arose to speed up economic progress of Ceylon for the betterment of the long suppressed populace. Famine required to be wiped out; poverty needed to be abolished; agriculture demanded to be supported by rehabilitation of ancient tanks at Anuradhapura and Polonnaruwa districts and many other districts of the island. Then again new modern irrigation schemes were required. Rt. Hon. D. S. Senanayake took up the challenge. It was within this backdrop the Gal Oya Project was speeded up. D. S. Senanayake was determined to make the dry zone suitable for agriculture once again as was in the glorius ancient era of Sri Lanka. Senanayake planned several large irrigation projects: the Minneriya scheme; Minipe Ela scheme; Gal Oya scheme. The grand Gal Oya scheme which gave birth to then the largest irrigation reservoir of Sri Lanka was his crowning glory. Such was the concept which drove the grand irrigation schemes of Free Ceylon since the independence: the first and foremost of the projects was Gal Oya, today somewhat overshadowed by the grandeur and splendor of still larger Mahaweli multi purpose irrigation project, the largest ever irrigation project of Sri Lanka. The research on the Gal Oya project had been continuing since early 1940. In the year 1951, “Gal Oya Valley Project in Ceylon” was in full swing. Gal Oya project in the Ampara district of the Eastern Province of Sri Lanka envisaged by impounding of 67 mile long River Gal Oya. It was a multipurpose project: the conservation of water was planned to yield benefits of flood protection to agricultural and residential area; control of irrigation to existing farmland and new falmland; resettlement of farmers who had been in the employment of landed cultivators; generation hydro electric power for the rural areas of Gal Oya and surroundings. Sri Lanka without coal, oil, or gas deposits depended solely on hydroelectric-power development. Gal Oya Development Scheme, the pioneering multi-purpose post-independence agricultural project in Sri Lanka, then called Ceylon, securing a vast extent of jungle to productive, irrigated, agricultural lands to meet the needs of an increasing population, involved in transforming a rural feudalistic agricultural community to a large-scale, state sponsored, agricultural expansion and colonization scheme. Gal Oya multipurpose project went onto colonize uninhabited areas with no less than 250,000 people resettled to pursue agriculture. Most of the settlers were from the area surrounding Gal Oya. Priority was given to those villageres in the Gal Oya valley who lost their homes and farmlands owing to the construction of Gal Oya reservoir. The remainder was from the rest of the island. Gal Oya Project, that irrigates the dry lands of the east of Sri Lanka, remains a glorious testament to the most ambitious irrigation development project immediately aftermath of the independence, though today the project is overshadowed by the gigantic scale of the Mahaweli Multipurpose Development Scheme.The completed Gal Oya project resulted in opening up 40,000 hectares of land to the cultivation of paddy, sugarcane, chilies, potatoes, and other crops throughout the eastern province. Gal Oya project in the process, by damming the River Gal Oya at Inginiyagala, its seven tributaries and 23 seasonal streams, went onto create the largest ever (ancient or modern) irrigation reservoir of Sri Lanka: Senanayake Samudraya (Sinhala: Sea of Senanayake) spreading 7700 hectares of the Gal Oya basin, which spread over an area of 179,200 hectares. 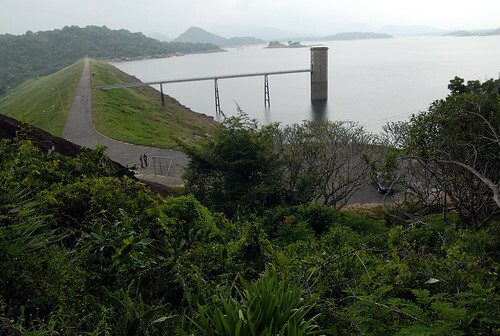 Modern Senanayake Samudraya irrigation reservoir bested the ancient Parakrama Samudra (2100 ha.) (Sinhala: Sea of Parkarama) at Polonnaruwa built by King Parakramabahu the Great (1164-1196 AD) during whose era the ancient island of Sri Lanka reached the pinnacle of glory by becoming the “Granary of the Orient” in view of its rice cultivation of enormous scale. Moreover, catchment area of the Senanayake Samudraya covered no less than 100,000 hectares. In order to protect the catchment area surrounding the reservoir, Gal Oya Development Board of Sri Lanka established Gal Oya National Park in the year 1954. Gal Oya National Park, a Sri Lanka Holidays tourist attraction affords the tourists to enjoy the spectacle of herds of elephant swimming from one island in the Senanayaka Samaudra irrigation reservoir to another island. Gal Oya National Park affords grand opportunities to the tourists to enjoy the enchanting landscape, the wildlife and the birdlife by means of boat safaris as well by jeep safaris.